← Build Your Own Low Impact Compost Heap! 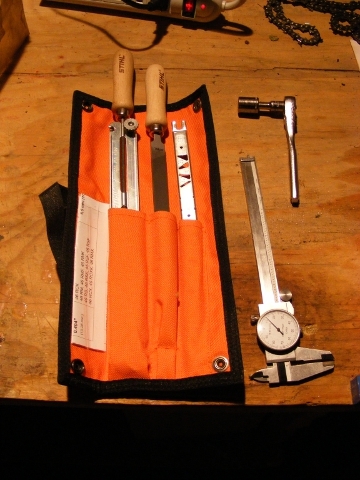 A typical manual chain sharpening kit. If you have any kind of a woodlot on your property, or if you intend to use wood as a heat source in the winter, you’re going to need a chainsaw. If you’re going to get a chainsaw, you’ll have to keep it sharp! Your owner’s manual should give you all the details like angles and radii, but seeing someone else do it can’t hurt! The first thing you’ll need to know is when to sharpen your chain. This is most easily identified by a lack of cutting power, the saw bogging down or stalling out during a cut, and most importantly the quality of the chips your saw is making! The size of the chips this saw is making means it needs to be sharpened. When you’re working with a chainsaw, calling your waste sawdust is pretty far off base. If your saw is making dust, or anything like what you see in the picture above, it’s time to bust out the files. 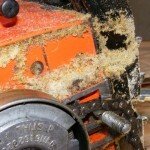 A properly sharpened chainsaw makes chips the size of confetti, or small animal litter. Why spend all that time and effort sharpening your chain though? Wouldn’t it be easier to just get a new chain and put that on? Well, no doubt it would be easier, but it would also be much more expensive. A replacement chain for my Stihl 015 is $18, and that saw is tiny. The sharpening kit in the picture above was $20 and the calipers were $15. I already had the calipers, but I’m an engineer, so that makes me an exception. Nevertheless, you can get all the tools to keep your saw cutting for $35. After 2 sharpenings, the tools will pay for themselves. Let’s say you sharpen the chain 5 times before it breaks or you run out of tooth to sharpen. Including the cost of the tools, thats $65 you’ve saved. If you’re cutting firewood or cleaning up after a storm, that is money saved over a week or two. Clean out the area around the clutch on the power head. You should do this after every time you use the saw. Now is no different. 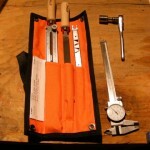 Using the depth gauge in your kit, clean out the groove in your bar. 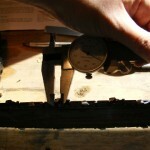 Measure the depth of the groove, and check for any horizontal play or bowing in the sides of the groove. 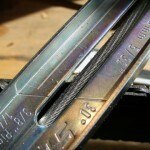 Check these measurements against your owner’s manual and buy a new bar if you have to. Reinstall the bar and the chain you need to sharpen. Using dial calipers or digital calipers, measure all of the cutting teeth along the length of the bar and identify the shortest one. This is the tooth you will be basing all of the other teeth on. Starting with the shortest cutting tooth, sharpen using the file and angle gauge in your kit. Sharpen according to the angles in your owners manual, and only file from the inside of the tooth outward. Measure the length of the tooth when you’re done, and make a note of it. 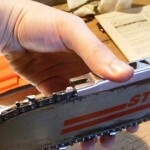 Sharpen all of the other teeth on the same side of the chain as the one in step 4. File them down until they are the same length as the tooth you noted in step 4. Sharpen the other half of the teeth on the chain that are on the opposite side. Make sure they are all the same length as the shortest tooth. There is a reason behind doing one side of the chain at a time. You will develop a rhythm and a feel for the angles that you need to maintain. Switching between sides will prevent you from falling into this helpful groove. Check the depth guides with the gauge in your kit. File down any that are taller than the gauge. 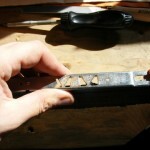 Make sure to bevel the leading edge of the guides so they don’t snag. 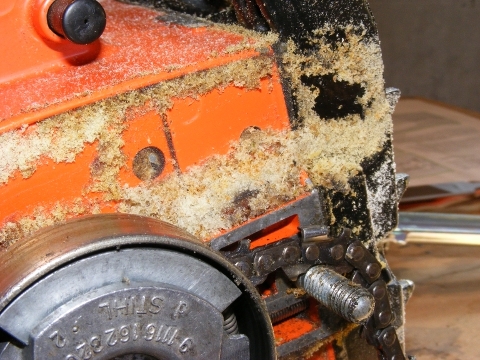 Make sure to clean your saw and check chain oiling every use! 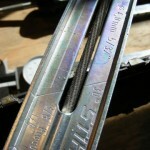 Check the depth and width of your bar with the gauge in your kit. Find the shortest cutting tooth on the chain. Use the witness lines on the file to keep everything lined up. You may have to file on a compound angle. RTFM Noob! Check your work with a sight gauge periodically. Use your gauge to check the height of your depth guides. That’s it! You’ve sharpened a chainsaw! The first time I tried this it took me about an hour. The second time was 30 minutes. Now, I’m down to about 20. Well worth saving $18 if you ask me. Make sure you take the time to do things right though. 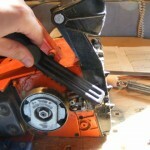 Filing all the cutting teeth to the same length will keep the saw cutting smooth and reduce grabbing and kickback. 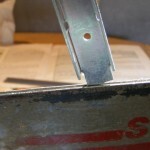 Filing the cutting teeth to the correct angle will keep you from binding and prematurely breaking a chain. Filing down the depth gauges will keep you from getting bogged down and will extend the life of your chain and power head. Keep your saw sharp and your cuts clean! This entry was posted in Tools/Equipment and tagged chainsaw, files, maintenance, PM, save money, sharpen, Stihl. Bookmark the permalink.